Why are Coconut products the latest rage? Coconut is a great replacement for other dairy animal fats. It retains it’s nutritional properties under high heats and so it’s great for stir frying. This versatile nut gives us several culinary products not to mention it’s beauty uses. Coconut butter is delicious and holds baked goods together when eggs or flours are not an option. Coconut oil can be used as a butter on breads and potatoes w/ a bit of coconut aminos ( a great substitute for soy sauce) to give it a salty sweet flavor. Organic, virgin, cold pressed coconut oil is optimal. Coconut aminos can be found at any health food store. I use it to flavor sweet potato fries, soups, and protein dishes. Mixed w/ fresh ginger juice and pineapple it makes a nice marinade like teriyaki sauce. I use coconut oil on my hair and it is said to whiten and disinfect teeth & gums when used in the Ayurvedic method of oil swooshing in the mouth. (check out www.authoritynutrition.com) Coconut cream and milk in curries and smoothies is rich in flavor and consisitency. Check out this recipe for coconut whipped cream. YUM! Use just as you would regular whipped cream. My son loves it in his coffee in the morning! 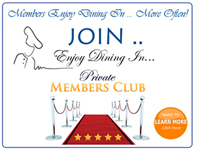 Join the Dining In Club!